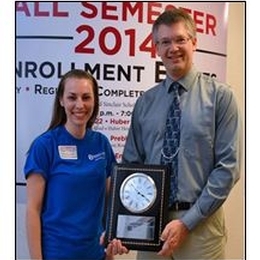 The first ever Learning Center Instructor of the Year Award was recently presented to Math instructor, David Hare (pictured accepting award from Learning Center Student Services Advisor Christina Cook). "You can tell that he really wants his students to succeed. Not only does he help with course material but he also helps with advice in your college experience, making sure you know when deadlines are and how to get the information he cannot provide." "He has made math easy, but in a challenging way. In other words he has made it possible for all students to be successful." "I constantly see him helping his students, even though he may be eating his lunch or busy doing something else. He stops whatever he is doing, packs up his lunch, and moves to the library to assist his students for as long as he can." Altogether, students nominated 16 instructors from the Preble County, Englewood and Huber Heights Learning Centers who have made a difference in their lives or made them better students.